WTP CHP11 is a fast acting non-foaming, non-tainting biocide. 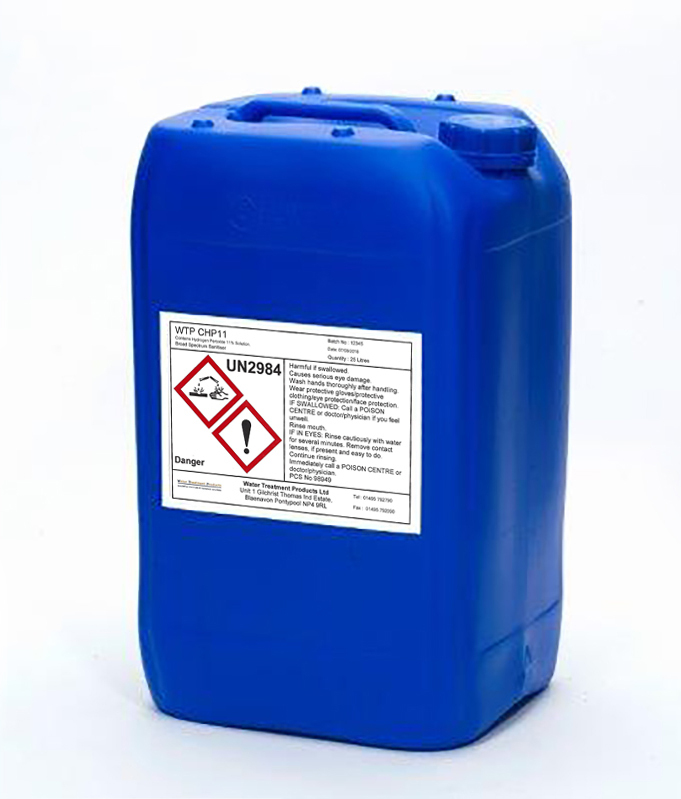 The biocide is based on Hydrogen Peroxide and as a result, the decomposition products are completely safe. WTP CHP11 is a DEFRA Approved product for General Orders. WTP CHP11 consists of 11.0% Hydrogen Peroxide. Based on clean systems containing fresh mains water. WTP CHP11 works best on clean systems and should be considered a final treatment following thorough cleaning. Hydrogen peroxide drop test kit is available to determine correct levels in the system (WTP TK114). WTP CHP11 breaks down into water and oxygen. WTP CHP11 undiluted is a powerful oxidising agent. It is heat sensitive above 60ºC – spontaneous decomposition may occur. Contact with brass, bronze, chromium, copper, iron, lead, manganese, nickel, silver, zinc and other catalytic metal will accelerate decomposition. Contact with concentrated acid, alkalis reducing agents, dirt, ash, rust or metal dust will also cause spontaneous decomposition. Therefore these materials must be absent in transfer pumps and pipework. (Please refer to Material Safety Data Sheets for detailed handling and storage information). WTP CHP11 treatments are shipped in 25 litre vented drums.